About "ESV Study Bible (Black Letter Edition)"
This premier study Bible is packed with expert annotations, full-colour maps, illustrations, charts, timelines, and topical articles by an outstanding team of 93 evangelical scholars. Also features finest quality paper and binding, 9-pt type, single column text, concordance and book introductions. 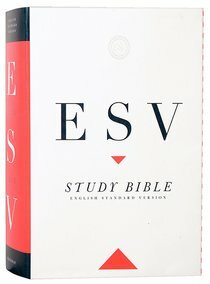 Customer Reviews For "ESV Study Bible (Black Letter Edition)"
This would have to be the best study bible on the market, all things considered! It is a well designed volume containing 2750 pages with a solid binding. The contributors are taken from a host of american evangelical teaching institutions from the broader evangelical world all adhering to a high view of Scripture interpreting the text from a grammatical historical method - the way God intended. Each bible book has a thorough introduction with comprehensive outline. The page layout is compact but not cluttered. The biblical text is found in a single column with cross referencing verses parallel to the centre spine, the notes with imbedded charts, diagrams, illustrations and colour maps found at the bottom of the page. Wow. A great feature is the scholarly articles at the back, could be considered a self-contained book or primer on a biblical worldview. An access code is provided with any purchase for online access and a kindle version. Buy it, many have! ESV Study Bible, eBook-ePUB is a total waste of money! the Koorong eBook reader is rubbish too, crashes everytime it is opened. Save your money and buy a real book. Although the church that I attend no longer uses the ESV for public Bible reading, I still refer to my copy of the ESV Study Bible regularly when preparing Bible studies, sermons, or during my quiet times. The study notes are comprehensive and informative, and the featured articles provide valuable information that helps unpack the Bible text, and illuminates the user's understanding of the overall picture of Scripture. If you are an ESV user, this is an essential addition to your library. The ESV Study Bible, alongside The Reformation Study Bible are my go-to study bibles. The ESV Study Bible is packed with useful notes, maps and other information. I especially love the introductions to each book of the bible, definitely recommend if someone doesn't know which study bible to go for. The ESV Study Bible is a terrific Bible, the study notes are quite detailed and the maps are great. The Bible font is very nice, but I've struggled at times with the font size of the notes, which unfortunately means anyone prone to tired eyes, or sight issues will need a magnifying glass. Having said that, it's worth the effort.